Hey Joran, instead of saying “I do,” just admit “You did it”!!! 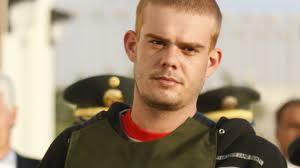 Is Joran Van der Sloot going to marry while behind bars in Peru and serving a 28 year sentence for the murder of Stephany Flores? Are nuptials in the air for the convicted murderer and the prime suspect in the death and disappearance of Natalee Holloway? Or is this just a PR stunt by his attorney? As Joran Van der Sloot and his attorney attempt to appeal his murder conviction is the “little Dutch Boy” also picking out China patterns? Where would he register? Do bullet proof vests come in black with matching cumber buns? Van der Sloot’s defense attorney was named by the paper as a source – but he denied the report. More from the Daily Beast. And as Van der Sloot tries to squirm his way out of a 28-year sentence, there’s another hot piece of gossip: the possibility of his upcoming nuptials while behind bars. The news broke late last week as local tabloids asserted that he plans to marry and unidentified woman. It’s not the first time Van der Sloot has been branded as a lady’s man—just last year, while he was awaiting trial, a story broke in the local media that a pregnant young woman was carrying his child. She denied it on Peruvian television. It is rather sad and quite pathetic that such a news story would be spread by Team Joran Van der Sloot, especially when his victims Natalee Holloway and Stephany Flores will never have the chance to have their wedding day. Now Peru gets another taste of this human waste trying to lie his way out of a sentence he does not like. Too bad Joran, your lies and the help you got from your POS father and his cronies in Aruba saved your worthless hide, but this time lies will not help. What woman in her right mind would want to be associated with Joran? @Texas Grandfather – No woman in her right mind would want to be associated with Joran. As we have seen in the past, however, some women just can’t get enough of these psychopaths that are incarcerated for killing women who didn’t realize they were in the clutches of the devil himself. Those women that want to be involved with Joran, the psychopath, well know who he is, the devil himself. There is no excuse!!!!!!!!!!!!!!! Was Jurine ever put in general population in prison? I read this story last week and thought, how typical of Joran. Anita VDS has now reconciled with her Murdering Son and is footing the bill for his continued Legal expenses moving forward. I hope he does make it out of Peru alive, if only to be extradited here and face his Federal Charges in US. Then he should also be hit with a Civil Liability Trial. He is only marrying to use that to his advantage to garner more priviledges that his Marital Status in Prison would allow him. Really, I don’t believe this.